FIREFLY has a long history with COBRA, going back to when the evil organization first began causing trouble. An expert in mountain climbing, he uses his skills to break into places that are supposed to be out of reach. He can scale a cliff or building as easily as a fly walking up a wall. He has highly developed reflexes and expertise in hand-to-hand martial arts combat, as well as being an expert with various weaponry and explosives. 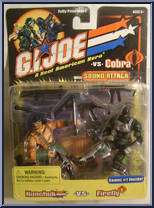 COBRA likes to use him when a single saboteur is needed to quietly break into a secured location and cause some trouble. He encountered the martial arts master NUNCHUK from the G. I. JOE team and, for the first time, had to escape before being captured. Now he longs to revenge [sic, should be avenged] himself for his humiliating defeat. "COBRA calls me in to do the impossible, because I can make it happen." The U.S. military prepares its soldiers to defend themselves against the enemy with tough training that makes them strong, fast, and unflinching in the face of danger. NUNCHUK has prepared the G. I. JOE team to defend themselves against enemies who may use the martial arts in close combat. NUNCHUK is an expert in most forms of martial arts and incorporates key moves into the traditional fighting techniques of the American soldier. While the team may be uninterested in the more mystical aspects of the martial arts, they are enthusiastic about the techniques that give them powerful ways to defend themselves in hand-to-hand combat. During a mission to stop a sabotage attempt against a nuclear facility, NUNCHUK fought against FIREFLY, a martial arts master so skilled that NUNCHUK barely escaped with his life. Now he's out to get FIREFLY, furious that someone would use the martial arts for evil purposes. Contribute pictures, update details or suggest corrections for Nunchuk vs. Firefly. Write a review about Nunchuk vs. Firefly.